Could A Personal Loan Help Me Manage My Money? If the last Christmas and New Year festivities were occasions for excess, your bank balance or credit card might have taken a big hit over the last few of months. If you're having a bit of difficulty getting your finances back on track, you might think a personal loan could help you. Personal loans are usually unsecured which can be helpful if you're working full-time with a good wage and a good credit history. They're generally a hassle-free way to get a lump sum of cash when you're looking to buy a new car or a holiday. But for anyone with a low or bad credit rating or on a lower income, taking out a personal loan can be almost impossible. Formal credit checks will stop your application in its tracks while a low income will probably increase your interest rate and extend your repayment length - so what are your options? Well, before you make any decisions, we've put together a list of helpful tips to help you manage your money more effectively in 2017. Some of these could help you in the short term, but hopefully they'll get you on track to save money in the long term too. If you're still looking to take out a loan, pay special attention to number 7 on our list. Together with these tips, it could be the best money saving option for you. Credit cards usually take the majority of big spends through the year. While it's certainly convenient, it's expensive and far from being cost effective in the long term. By transferring your balance to a new 0% interest credit card, every penny you pay will come off your bill, meaning you pay off the debt quicker. There are plenty of comparison sites that will help you find the best deal, with many offering well over two years of interest free credit. So after paying a relatively small balance transfer fee (though even that can sometimes be free), you could pay off your credit card debt in months rather than years. And without all the fees and interest, you might even be able to increase your payment each month too. It's easy to whip out the credit card each time we need to make a purchase. But, as explained in point one, the interest and fees quickly mount up, so how about exploring a prepaid card? It looks just like a regular credit card, and you can use it in shops or online, but you can only spend what you put on there. If you have credit problems already, this is a great way to be able to make online purchases when you don't have any other kind of credit or debit card. You can load it up with a set amount of cash each month and use it to budget your way through the weeks until you can afford another top up. You could get charged a small new card fee, but transaction fees are usually free meaning you won't get charged when you use it. As the card doesn't actually give you credit, applying for one is easy as it doesn't rely on credit checks. It's a good option if spending on plastic can get the better of you. Not much use for online purchases of course, but if you can budget a set amount each week or month for smaller day to day cash purchases, it could really help. Not only could you dip into it to buy occasional things like milk, bread or pay & display parking, it could be a handy pot for other smaller expenses. Some outlets don't even allow any card transactions under £5 or £10 as it costs them money, so you could end up spending more just for the convenience of using it. Using cash would soon end the temptation to buy more like you would with a credit card, and having a budgeted amount each month will make paying for small things like stamps and bus fares much easier to pay for. After a few years where energy prices have stayed the same or may have even been cut, it's only a matter of time until the prices go up - especially if we're in for a prolonged cold snap. It's easy to switch providers and getting a better deal could save you more than £400 a year on your bills. There's bags of choice around to get a better deal and now's the time to start looking. Home and Contents Insurance is another area where you could save. Once we set up our insurance, we tend to forget about it and carry on paying regardless. However, it's worth periodically checking your policy and payments, then using comparison sites for other insurance companies and their charges. Companies love new customers and frequently offer deals to make it more appealing. They can even give you further discounts when you buy online. Nowadays, our smartphones are vital to the way we live our lives. Every provider offers deals that include hundreds of free call minutes, texts and data so we can stream, download and connect whenever and wherever we want. But are you making best use of your contract? If you don't use your phone that much, you could be paying well over the odds. If your monthly contract is giving you far more minutes, texts or data than you actually use, contact them to talk about changing your tariff and you could see your monthly charges go right down. There's no point in getting 5,000 'free' texts if you only send 50 - you're still paying for them within your monthly contract price. If you're a low user and want to stick to a real budget, you could explore a pay-as-you-go option. That way you will only pay for what you use and you're in control of how much you spend. How many of us have taken up a subscription for something, then lost interest, but still end up paying for it each month? A great way to immediately cut an outgoing is to cancel any unused subscriptions. If you pay by direct debit for any subscriptions, you can easily cancel them with your bank straightaway. You could have subscriptions for magazines, a gym membership or a bolt-on to your digital TV package. Instead of paying monthly for something that you're not getting full benefit from, you can pay separately as and when you want to buy. Subscriptions are usually paid in advance too, so even though you cancel a direct debit, you might still get the benefit of it for another month or more. If a loan of some sort is what you're looking for to consolidate any debts or help pay towards an event or occasion, one alternative to a personal loan is taking out a secured loan against your car. Unlike personal loans, with Car Cash Point there are no formal credit checks made on you. This means if you have bad credit already or have been refused credit in the past, it won't stop you being able to take out a loan against your car. And with loans available from £500 all the way up to £100,000, then your chosen loan amount is going to be available. Car Cash Point provide the cheapest and best value logbook loans in the UK and we'll help you withdraw the cash held in your car, providing you with a lump sum when you need it most. As long as you own your car and it's free from any finance, we'll be able to help you. Speak to one of our expert advisors today on 0333 220 4419 and they'll talk you through our simple 3-step plan to help you get the money you need. They'll discuss your details and agree a repayment plan that works for you. And the best part of getting a loan against your car? Our logbook loans are never beaten on price and if you find a cheaper lender elsewhere, we promise to beat that price by 10% - guaranteed. Plus, the car is still yours to drive and use as normal over the length of your loan. 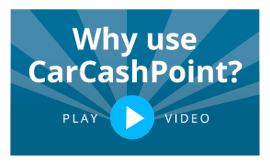 So, for a quick and easy way to get the cash lump sum you need to help budget your way through 2017, Car Cash Point can approve a loan against your car within minutes and you'll get your money transferred on the same day - usually in just one hour.